Since the GW webway portals can be hard to come by, I decided to try my hand at making a Dark Eldar webway portal at the prompting of Mr. Esty from Enter the Nurgling. ...These have to be easy to recreate at home on our own, no? Isn't it just a painted dome? What do you think of doing a tutorial, or a how-to-make your own article? It just seemed like something you'd be good at (I've never tried painting any lightning FX myself before). Well, he's right, they aren't too hard to make it turns out. While you could pick up the GW version (or you may already have it since it bears a striking resemblance to another well known template) there is always the option of making your own version. So I set out to see what I could do. The first step was finding a suitable "thing" that I could use to make the actual template. I had a rough idea of what I was looking for and it only took me a day to find it. Turns out, an official plastic Wiffle ball is just a couple millimeters short of 3 inches (the width of the GW version I'm told). Half of the Wiffle ball has holes in it and the other half is solid... guess which half we need for our project. Now you purists might balk at the very slight size difference, but I think for most people, this won't be an issue at all. In addition to the Wiffle Ball, you're going to need a few other things to pull this off. Once you have everything, it should only take about a half hour (including dry time) to make one. And I'm sure you can always make a couple of these at once as well to cut down on your time. So let's get to it then. Getting it cut in half was easy to do. 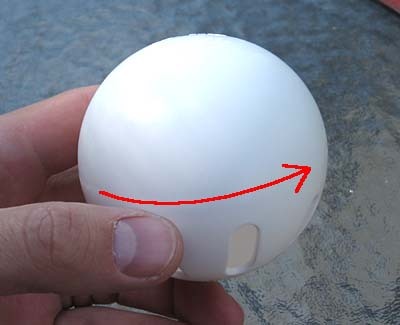 Since the ball is plastic, it's easy enough to follow the seam around the middle of the ball with an X-Acto knife and cut it right in half. Some cleaning up around the edge and you've got your template. Now there is the issue of the molded text on the ball. While the text is small and not very obvious, it still has to go. We can't have that junk on there. This can be CAREFULLY shaved off with your X-Acto blade (hold it sideways) and then use a bit of a scraping (similar to cleaning mold lines) once you have the majority of the text cleared away. This concludes the construction portion of the tutorial. With your "template" ready to go, it's time to get to painting. This is where the gloves come in, so you don't end up spray painting your hands while you're working. NOTE: I picked two colors I thought looked cool. You can use Black, White and any two colors that suit you and match your army. You obviously don't have to use the two blues that I chose here. The important part is that you get two colors... one light and one dark. And I use the cheap spray paint too. First we prime the thing black. Make sure to let this dry completely before moving on. I told you we would need gloves. Once you have it primed, it's time to do the real painting. 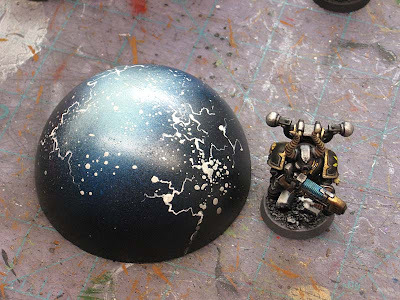 You may want to try a few practice runs on some cardboard lying around just so you aren't surprised and you get the effect/shape you're looking for when you go to paint the real thing. The picture above breaks the template down into three areas. 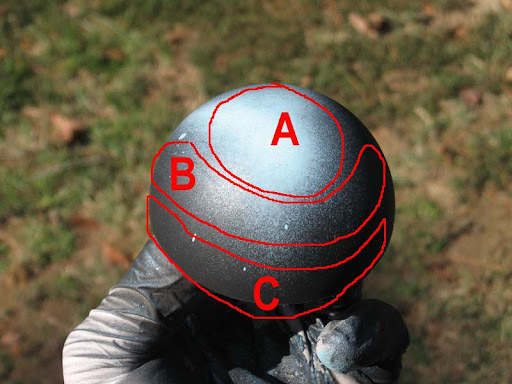 It also goes in order... A,B and then C.
A: Where you paint the highlight using your lighter color. Just a quick spray or two like you see in the picture. B: The area where you paint all the way around the template with your darker color. The idea is to help blend the lower portion of your light area into the black at the bottom. NOTE: You may want to go back with your lighter color after step B and put a tiny highlight back on the template. You can go back and forth between A and B until you have the look you want. Just make sure to let each step dry completely before spraying. C: The bottom where you add the black. You actually paint just below the template (hence the gloves) and let just a little bit of the spray cover the very bottom edge of the template. The idea is to get black at the bottom without covering too much of your work on top. With these three steps done, set it aside to dry before adding the lightning. Adding the lightning is done in two parts. 1. Get your white spray paint and a scrap of cardboard (remember that piece you used to test out your patterns on?) and make yourself a puddle of white paint. Quickly take your gloved finger and get some paint on it and then flick your finger at your template. Once again, you might want to practice this a couple times before the real thing to make sure you get the right amount and pattern you want. With everything completely dry, take your regular white paint and a detail brush and go in and add a variety of squiggly lines radiating out from some of your larger drops of white paint. 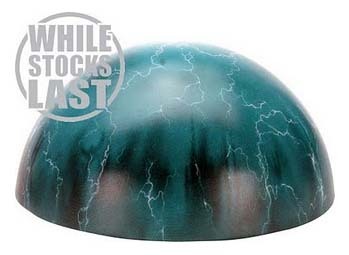 This will make the lightning look like it's concentrated in some areas and not in others. Add lightning "bolts" until you have the desired effect. Give it a quick gloss varnish and you're all set. I chose the gloss over flat so the piece would stand out on the tabletop a little better. 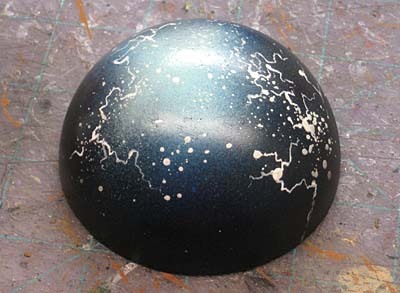 It will most likely be the only high gloss piece on the table and that will help better represent the ethereal warp like quality it should have. You can see how it looks compared to a regular 25mm based marine there. All in all, a fairly easy process with some good results. And even better is the fact that you can use colors to make it match your own army. While it looks like I just threw this together real quick and it came out great looking, it took me a number of attempts (read at least a dozen) to get it this way. If you're going to try this, please do yourself a favor and do a few trial runs on the side of a box or something before putting any paint on your template. If you use this template and find a way to improve on it, please let me know so I can add a note here for others to see. Thanks. I've since posted another method or idea for making webway portal out of basic 60mm sized bases. You can read about that process here. Brilliant as always. Cheap and quick...will definately be using this!...at some point! Awesome -- looks better than the real thing and can easily double up as a vortex grenade marker in apocalypse! Thanks guys... and yes, it doubles as an Apocalypse template. HAHA! This post is full of WIN. Take that GW. Love this! Great tutorial! Thanks Ron for making it look so easy! Where'd you pick-up the ball? When I saw the 'official' template, I though a wiffle ball cut in half and spray painted would work just fine - apparently great minds think alike! Yours looks better too. 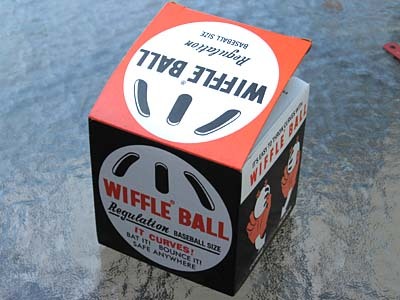 It's also funny to see that a wiffle ball box hasn't changed over the years. I had thought of a styrofoam ball, but opted not to because it's lack of smoothness. A whiffle ball never even occurred to me. Thanks! Mr.Esty: Just about any large sports store should have them. This one was given to me by a friend to try out since he knew I was looking for one. great tutorial, too bad so many people wasted money buying the GW one. Its so disappointing to see how wasteful some hobbyists came be with their hard earned money. 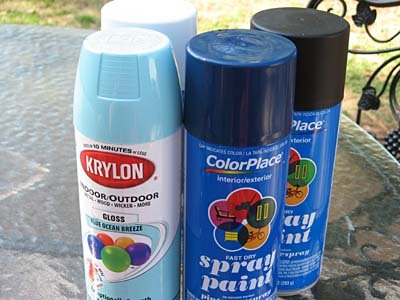 You could also use a vending machine ball (the one that come with toys inside) and something like plastikote crackle spray paint. £10 and 5 minutes and you've got half a dozen portals. Mimicking the buildings in the GW portal wouldn't be hard to do either, come to think of it. You'd just have to layer on some blurry black steeples; quick single-strokes with your brush with some embellishment, or maybe wetblend the image on if you're feeling adventurous. Awesome. I'm going to try this! Great work! 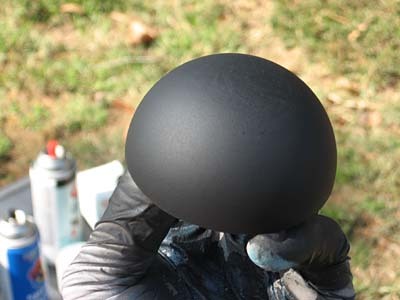 I was looking at doing some of these but using the color shifting paint or the black chrome paints as the base color then adding the lightning over the top. Either one would give a great effect and look more like a real storm. 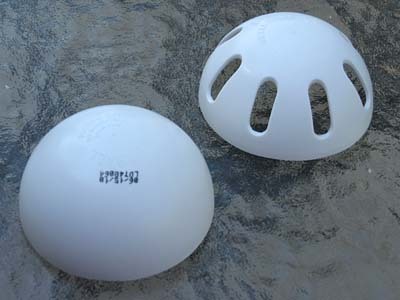 I've had some trouble finding "Wiffle Ball" distributors in Canada, only available online. I'll email you as soon as I find a suitable alternative. Diehard2501: I never thought about color shifting paints. I suspect they would work just as well, just cost a bit more I'm sure. Mr Esty: Hmmm... I'm not sure about you guys up North or even across the pond. Online might be the only option if you can't find a suitable alternative. Good luck, if you find something though, definitely let me know. This is really cool. For anyone having trouble finding Wiffle Balls, I'm going to use some clear plastic balls I got at a hobby store that are two piece make-your-own-Xmas-ornaments. Same diameter as the portal and only a dollar for the two halves. Anon: Another perfect solution and thanks for sharing the idea too. I would buy the official template at retail price except for the fact that it sold out after a ridiculously short amount of time of availability = obvious disconnect between demand and supply. Now that I am forced to either use only a flat template or this, I opt for the nice looking scratch version. Thanks for the tutorial! You can use a "squash-ball", or "racket-ball". This is what I'm currently using, and it matches the diameter of a small blast radius exactly which is 2.5 inches. I may even use some painters tape cut in very small slivers to add a little more detail. Thanks for the lightning info! Ill be making everyone envious of my raiders, ravagers, and venoms! josh from p.a. : Thanks for the tip. I went with a ball that had some rigidity in this case. How does the racket-ball hold up to use? Does it's flexibility cause any issues with paint coming off?